Flash Sale, Ends November 22nd! This week you also get a free KeyFob. We've reduced our up-front fee to just €99, making it even easier to secure your home, saving you €400! This week only you can get a free KeyFob(RRP €90). The KeyFob allows you to arm and disarm your alarm with the press of a button and it also functions as a panic alarm by pressing the top two buttons together for around 3 seconds. 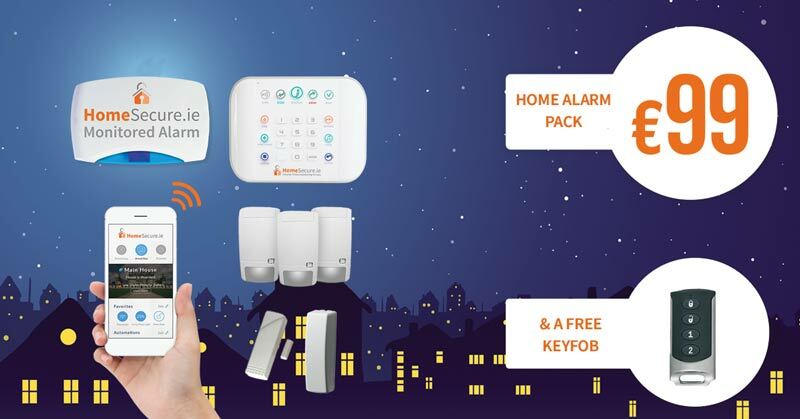 *Joining HomeSecure.ie is subject to a three year minimum monitoring term. Our €99 up front promotion, free KeyFob deal must end November 22nd 2018. All customers fully own their system at the end of their 3 year term. We guarantee no price increase during their 3 year contract period. Free servicing and replacement parts covers all faults for the duration of your initial contract term, this does not cover accidental damage or service visits outside of business hours.